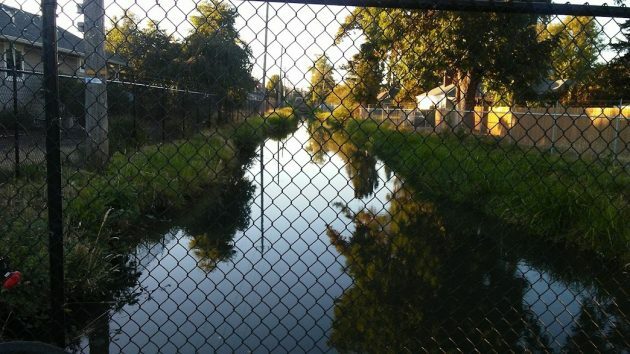 Here’s what the Albany-Santiam Canal looked like through the fence at Ninth Avenue on the evening of July 31. Want to see what it looked like without the fence? 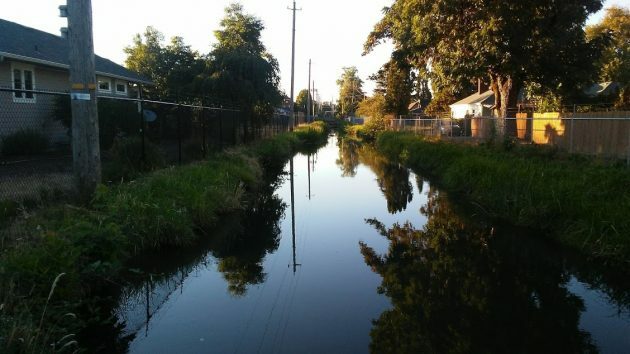 Maybe it’s just me, but as a scenic attraction in the Monteith Historic District, the canal looks better this way. And as the 2001 urban renewal plan proposed, it could become a major asset in Albany’s livability if the city wanted to make it one. It is, of course, more than a potential scenic attraction. It’s also one of the two sources feeding the city’s water system, the other one being an intake on the Santiam River near Scravel Hill. And then, during the winter and spring when the flow in the South Santiam near Lebanon allows, the canal also powers Albany’s 500-kw generator in the historic Vine Street powerhouse. Albany has a federal hydropower license covering the generator, the 18-mile canal and the headworks on the South Santiam above Lebanon. Keeping up with the regulatory requirements linked to that license is expensive. I don’t know how expensive, but it’s more than what’s warranted by the $80,000 a year on average in power sales. One choice facing the council before too long is to abandon power production. But the need to maintain the canal as a water source would remain. For more than a year now, Albany has worked on another option: Surrender the power license but at the same time obtain from the Federal Energy Regulatory Commission (FERC) what’s called an exemption for a small-conduit hydroelectric facility. He and others have been working on this alternative with state and federal agencies for more than a year. In March 2017, the city council allocated up to $90,000 for outside legal and other professional services. Yeager says expenses so far are well below that. Drafts of the applications — to surrender the power license and get the small-conduit exemption — should be finished soon, Yeager says, after which the city will again seek the consent of state and federal fisheries agencies. The council then will have to decide on whether to proceed. How soon? Nobody knows. From out to say 34th Ave into the “power plant” it ought to be put into a big tube. That is nonsense to make it into some kind of an open attraction. The flow is too swift to NOT have a fence around it! Without a barrier & the 1st brat that falls in… the City will have a lawsuit. Once enclosed & paved/covered over the City could have its promenade. It would extend the bike path south by a good 1/2 mile. Just keep the canal secured. My understanding is that open running public water supply is illegal to begin with. So does that make the S. Santiam illegal? Going to be hard finding little jail jumpsuits for the Salmon and Steelhead. Karen Kelley, Albany water superintendent, responds: Public water supplies can come from surface water bodies including lakes, rivers, streams and canals. In fact, several hundred public water supplies in Oregon are supplied by such water bodies, including the City of Albany. However, once that water is treated to drinking water standards, it must be stored and delivered in closed systems (tanks and pipelines). After water from the Santiam-Albany Canal is fully treated at the Vine Street Water Treatment Plant, it is pumped into a closed distribution system according to Oregon Health Authority requirements. Contact OHA at 971-673-0405 for more information. Are we considering the water being tainted by human hands? City of Corvallis had a potential issue with this years ago. Public water needs protections. I agree with Jim Engel. And most of everybody else. Public water needs to be protected, I say leave the barbed-wire fence in place. And install more where it is open to the public. I can only imagine what someone could do to the water supply. Where is the barbed wire? I see only cyclone fence.